In a world of crossovers and SUVs, there's something refreshing about a mid-size sedan built with quality, luxury, and performance in abundance. The 2019 Subaru Legacy was made to hold everything together so you can spend more time connecting to what matters most in life. 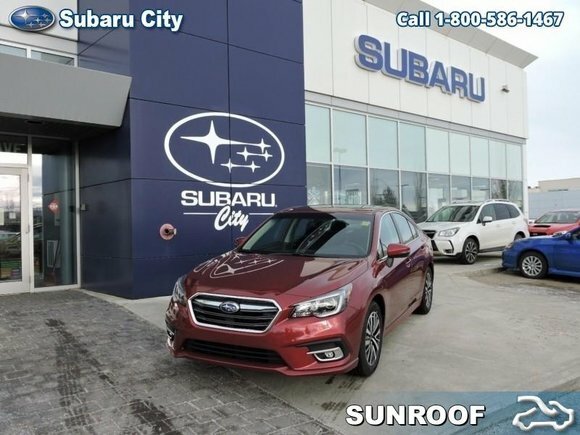 With top shelf infotainment, luxurious and spacious seating, and an aggressive exterior style to match its impressive performance, the 2019 Subaru Legacy is here to help you enjoy driving again. This red sedan has an automatic transmission and is powered by a 2.5L H4 16V MPFI DOHC engine. Given that frugal motor it gets 9.3 L/100 km in the city and uses just 7.0 L/100 km out on the highway according to Transport Canada. Our Legacy's trim level is 4dr Sdn Touring CVT. Upgrading to this Legacy Touring will get you an 8 inch touchscreen infotainment system with STARLINK smartphone integration (including Aha radio), Apple CarPlay and Android Auto functionality, and steering wheel controlled audio. For even more luxury it packs in a sunroof, voice activated dual zone climate control, a leather steering wheel, rear view camera, automatic headlights, fog lights, a power driver seat, and heated front seats. For added safety it throws in SRVD, Subaru's rear/side vehicle detection program with blind spot assistance. This vehicle has been upgraded with the following features: Sunroof, Blind Spot Assistance, Heated Seats, Rear View Camera, Starlink, Steering Wheel Audio Control, Bluetooth. Want to try the 2019 Subaru Legacy 4dr Sdn Touring CVT?